One Hyde Park: The Residences at Mandarin Oriental is a modern residential development in Knightsbridge, London, on the site of the former Bowater House office building (originally built in the late 1950s). The site is located between South Carriage Drive in Hyde Park to the north, Knightsbridge to the south, and between the adjacent Wellington Court to the west and Mandarin Oriental Hotel to the east. The development delivers 86 residential apartments and duplexes and three retail boutiques within four interlinked pavilions. These step up in two-storey increments to give, from west to east, buildings of 10, 12, 14, and 12 storeys respectively. It also incorporates reception, business suite and exclusive leisure facilities for the residential component of the scheme which are managed by a dedicated Residences at Mandarin Oriental team, as well as substantial additional leisure and service space that has been created for Mandarin Oriental Hotel and is separate to residential leisure facilities. There are three retail units at ground-floor level fronting onto Knightsbridge. In total, approximately 370,700ft2 (34,340 m2) of residential and 9,000ft2 (836 m2) of retail space is offered by the development. The scheme also provides 139 vehicle and 114 cycle spaces across two basement levels. One Hyde Park seeks to complement the existing streetscape of Knightsbridge and create a scheme that offers daylight and generous views whilst achieving the necessary degree of privacy for its occupants. The project is designed to be flexible and legible. The residential pavilions are separated by a series of fully-glazed circulation cores, incorporating stairs, lifts and lobbies. The passenger cores are used by the development’s residents for primary access to the apartments and penthouses, and service cores are used for secondary access by staff and for providing service access to the apartments. The superstructure of the residential accommodation in each pavilion comprises an exposed, pre-cast concrete frame, expressed externally in two-storey elements. The façade system of the residential levels utilises a series of vertical blade-like elements set within the concrete frame. The twostorey- high screens that form the main façade are of pre-patinated copper alloy, with the patination complementing the colouration of building materials in the immediate area. The primary function of the screens is to provide privacy to residents as well as to control views out of – and into – the building. These screens also provide solar shading which gives depth and modeling to the façade. The façade system becomes more transparent to views from Hyde Park and Knightsbridge and is predominantly solid when viewed from adjacent properties. The top levels of each block comprise two-storey penthouse accommodation which relates and responds to the roofscapes of neighbouring buildings. The façades of the penthouses have been developed to incorporate the geometry and privacy aspects of the façade system below. Edinburgh Gate has been relocated to the western edge of the site to become a new gateway to the Park. The roadway is covered by a canopy and the top surface is planted to provide a visual amenity for all those overlooking it. The sculpture (‘Rush of Green’ or ‘Pan’ by Epstein) which formed part of the composition at the northern end of the existing Edinburgh Gate has been repositioned to maintain its relationship to the new roadway. A new pedestrian route through the site – Serpentine Walk – is created along the eastern edge of the site, adjacent to Mandarin Oriental Hotel, on axis with Sloane Street, linking the Park to Knightsbridge. The original Knightsbridge Underground station entrance has been relocated adjacent to Mandarin Oriental Hotel and is positioned to align with one of the circulation cores. The entrance is formed from a palette of materials similar to those used in One Hyde Park – glass, steel and concrete – creating a structure with a glazed roof and walls that are both open and solid. Renowned lighting artist, James Turrell has been commissioned to create a unified lighting concept that interacts with the development’s architecture. It includes perimeter lighting for the five glass stair and lift structures and a colourful light display (the LEDs are a mix of red, green, blue and white lamps that will render every possible colour in the spectrum). The project comprises of works for the main entrance of the residential lobby’s canopies and of works for various internal elements of the building. His sculptures will also illuminate the glazed stair and lift cores that link the pavilions and a canopy that is positioned over the new Edinburgh Gate entrance to Hyde Park. A sophisticated, computerised program controls Turrell’s input allowing the colours to slowly change over the course of time from sunset to sunrise, gradually phasing in and out from one colour to the next. In addition, the development provides a substantial proportion of high-quality affordable housing in the City of Westminster on a separate site within the borough. Peel House, Pimlico, comprises 70 homes – 66 apartments and four townhouses – and goes beyond the adopted local, regional, and national planning policy in terms of its quality. Peel House is one of the largest affordable housing schemes to be delivered in Westminster in recent years. The former Police training quarters has been restored and renovated to the highest standard by a group of leading consultants. The nearest underground station is Knightsbridge on the Piccadilly line with rapid access to Central London. 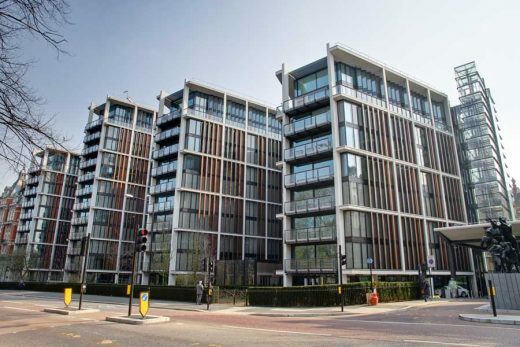 A six bedroom apartment in the One Hyde Park development in Knightsbridge, London has sold for a stunning £140 million : Britain’s most expensive property.